This exercise is designed to encourage players to follow their pass. Passing in a clockwise direction players pass and then follow the ball to the next cone. Look for accurate passing and fast movement from players - accelerating to reach the cone as quickly as possible. 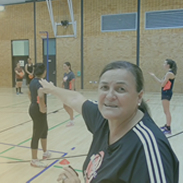 The coach can shout "change the clocks" at any time, meaning players must change the direction of the drill.